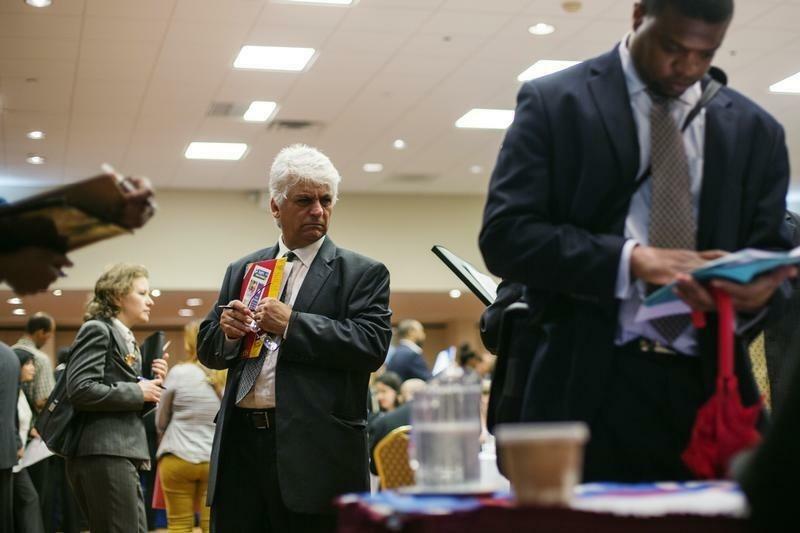 WASHINGTON (Reuters) - The share of unemployed Americans competing for each open job hit a six-year low in June, suggesting a labor market tightening that could give way to faster wage growth. The Labor Department's monthly Job Openings and Labor Turnover Survey released on Tuesday gave an upbeat assessment of the job market that could sharpen the debate on the timing of the first interest rate increase from the Federal Reserve. The number of unemployed job seekers per open job fell to 2.02 in June, the lowest level since April 2008. The ratio was at 2.14 in May and is now below the average from 2002 to 2006. "It reflects a jobs backdrop that continues to tighten on the supply side. There is not enough qualified supply out there to fill the job openings that exists," said Jacob Oubina, a senior U.S. Economist at RBC Capital Markets in New York. Job openings, a measure of labor demand, increased to a seasonally adjusted 4.67 million in June, the highest level since February 2001. At the same time, hiring reached its highest point since February 2008. Much of the increase in employment growth since the 2007-2009 recession ended had been driven by a sharp decline in the pace of layoffs, as opposed to a higher rate of hiring. Now, in a bright sign for employment prospects, the economy appears to be passing the baton to the hiring side. The so-called JOLTS report is one of the indicators being closely watched by Fed Chair Janet Yellen and other policymakers at the U.S. central bank as they contemplate the future course of monetary policy. The Fed has signaled it is in no hurry to lift benchmark interest rates, currently near zero, because of still-ample labor market slack, evident in sluggish wage growth and large pools of long-term unemployed and Americans who are working only part-time even though they want full-time work. "There is little slack remaining in labor markets, and wage growth will pick up more quickly than it did at similar levels of the unemployment rate in past cycles," said Michael Gapen, a senior economist at Barclays in New York. Job growth has topped 200,000 in each of the past six months, a stretch last seen in 1997. The unemployment rate has declined to 6.2 percent from 6.7 percent at the end of 2013. The rapid decline in the jobless rate has intensified the debate over when rates should rise, with a number of regional Fed bank officials arguing for sooner rather than later. Troy Davig, the head of research at the Kansas City Federal Reserve Bank, told Reuters on Monday that rising job openings suggested earnings growth was poised to move higher. "Faster wage growth certainly seems in the pipeline," he said. "The labor market appears to be hitting a turning point." Dallas Fed analyst Alan Armen, in a research articled dated Friday, forecast a half-percentage-point rise in wage growth, citing a survey from the National Federation of Independent Businesses showing small businesses increasingly planning to raise pay in the coming year. An NFIB survey released on Tuesday showed its compensation gauge held at a six-year high in July.